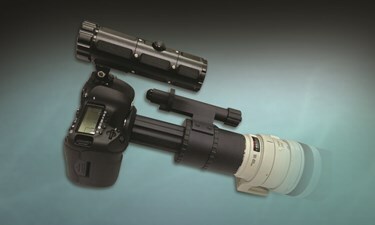 New clip-on system converts a standard Canon EOS 5D camera into a day/night SWIR imaging system. UTC Aerospace Systems announces the Sensors Unlimited Warrior C2S newest lightweight, field-ready shortwave infrared (SWIR) module and covert laser illuminator. The compact module locks into the front of a Canon EOS 5D camera (Mark II and Mark III models) to immediately provide operators with SWIR imaging capabilities on the battlefield for day or nighttime use. The system enables identification quality SWIR imagery, even in total darkness; with distinct advantages over visible, thermal and night vision goggle (NVG) systems, including the new module’s abilities to image through glass and to provide target accuracy with enhanced situational awareness. UTC Aerospace system is a unit of United Technologies Corp.
For added convenience, it couples directly with Canon EF-mount lenses, allowing the user to see through haze, smoke and dust for enhanced, long-range intelligence, surveillance and reconnaissance (ISR). The included 1550 nm laser mounts directly onto the Canon 5D hot shoe to provide covert illumination to visible, thermal, NVGs and the human eye. It can also view all battlefield lasers, as well as image SWIR markers and beacons. Even when bright lights and flashes are present, the Sensors Unlimited Warrior C2S provides unparalleled imaging capability in the field; other viewing technologies commonly experience degraded performance in similar circumstances. The Sensors Unlimited Warrior C2S module uses the uncooled SU640HSX SWIR camera core with 640 x 512 pixel resolution and a 25-micron pitch, together with the integrated 800x600 SVGA display and relay optics it is specially designed for gloved-hand operation with a large, environmentally-sealed power switch for easy access. The new system can be used with commercial off-the-shelf optics and cameras without the need for modification or tools and will be showcased with the recently introduced Sensors Unlimited Warrior HWH (handheld/weapon/helmet) viewer system at the upcoming Special Operations Forces Industry Conference (SOFIC), May 20 - 22, 2014, Tampa Convention Center, Tampa, Florida. Please visit UTC Aerospace Systems’ booth # 740 for a demonstration. For more information, visit www.sensorsinc.com.